This is Pam from Papillondigitaldesigns & TheBugBytes. I am the sassy designer for the day at She's a Sassylady. Thank you Sheila for having me share on your blog. I want to wish you all first a Happy New Year. I have been crafting a bit lately - yeah! I have been busy making flowers and embellishments and scanning to digitize my photos. But for today I will just share a card with you since it's just 6 days past new year. I used the silhouette for this project with some of their lovely echo park patterns. 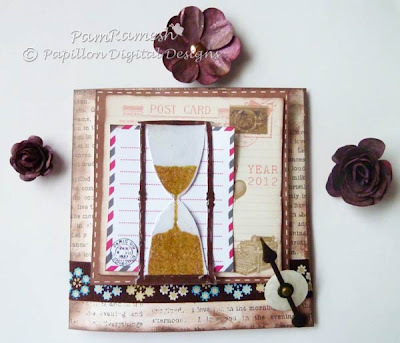 But the main image the sand clock is an svg file I created and is available at papillondigital designs. Funny how the hand (tim holtz brad mounted on button)- shows about an hour before 12:00 :) . It was on time lol but now guess it should point the other way. It is so simple except for a bit of cutting with the knife on the clock you can cut out everything with a scissor. In fact as my mat was not tacky enough and the file was broken up to 2 pages and more that's what I ended up doing! The inside of the paper was white and I wanted some color so I used dewdrops ink and smushed it on the paper using the dabbers (I love the finger dabbers). Then I had some brown ribbon with snowflakes on then which I think I got from archivers. I glued it on using fabri tac. Added glossy accents to the sand clock to get that glassy/stickery effect. You may note that the svg file looks a bit different as you can cut layers in that. In this I just used the advanced fill option in silhouette studio to get a transparent effect while printed. 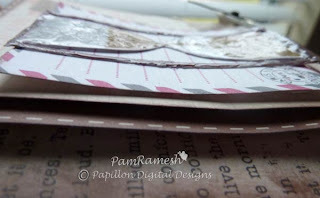 I used the dimensional glue dots for layering. With that you don't need pop dots/foam dots. The view of the button with a Tim Holtz clock hand brad stuck in it. So that's my new year card. Thank you for reading. Happy New Year to you my friend! This is such a beautiful card.... and wow all those steps for inking and laying adds up to a beautiful card. Thanks for sharing with us today at She's A Sassy Lady! Saw this at Sheila's! Great job! 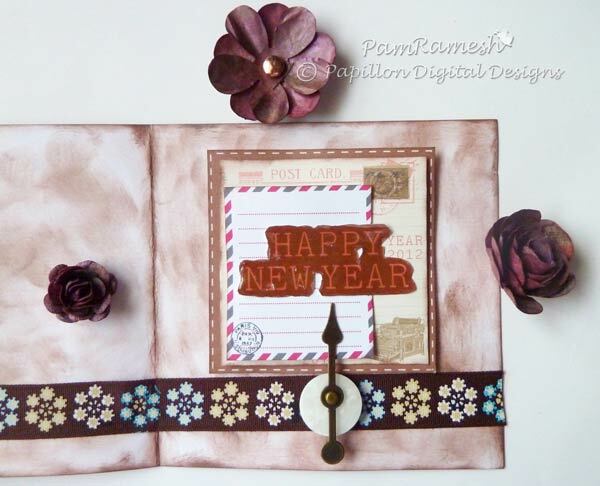 Gorgeous Pam - I love the gold - it really pops off the card - love all your extras too - like the clock hand!! Beautiful! Awesome job, Pam! I was just oggling the patterns at the Sil Studio this morning and have already put some on my wish list ;). Thanks for the inspiration! What a fun card with the sands in the hour glass!! Of course you had to add flowers!!! I see your blog every day in my inbox (and love it) but really need to come here every day so you know!!!! That is part of my 2012 resolutions! Love your blog, love that you share our work on your blog, love that you are always willing to help us out, love that you share your passion with us!!!! Happy 2012 Pam! !